The CAS-ual Friday challenge CFC117 is all about stitching. 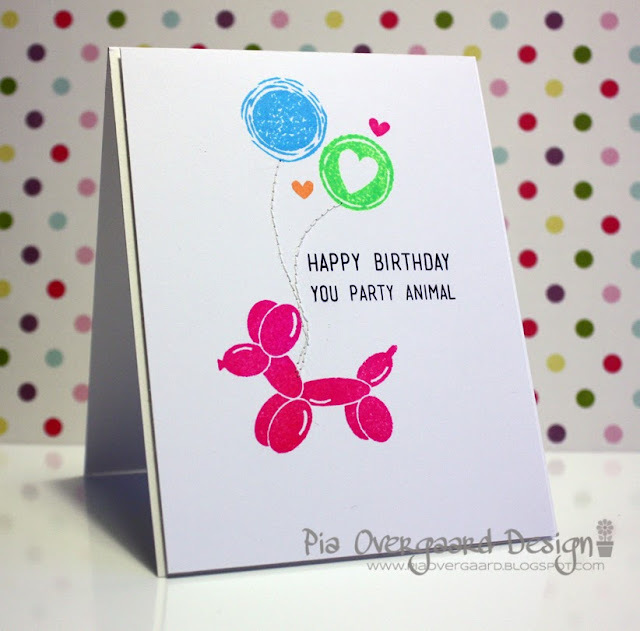 I love sewing on cards - so here is a simple birthday card, stiching the balloons on to that cute Avery Elle balloon doggy. Love the sentiment in that same Avery Elle stamp set - isn't it fun!? I am sorry about the bad photo - I have a hard time photographing in the evening - so if you have any good tips on taking card pictures in the evening - especially camera settings (I have a Canon EOD 450 SLR), I would much appreciate it! I am also entering this into the Pinspired Challenge #19 , I was triggered by the bright colors in the pinterest photo! Go check out that fun challenge site, if you don't know it already. I always love a good challenge and to see the inspiration from the design teams. Love your stitch lines to your balloons! Fabulous CAS card! Thanks for playing along with us at CAS-ual Fridays! aww this is too cute.. i love it.. thanks for joining us at PINspired Challenges..
Hvor er det kort bare sødt. Fine små balloner. So cute, Pia! Love the stitching from the balloon dog to more balloons!